XL 4596 x 6887px 15 Mb. Couple in wooden vintage interior enjoy guitar music. 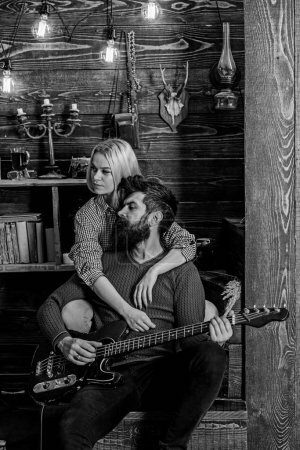 Lady and man with beard on dreamy faces hugs and plays guitar. Couple in love spend romantic evening in warm atmosphere. Romantic evening concept.